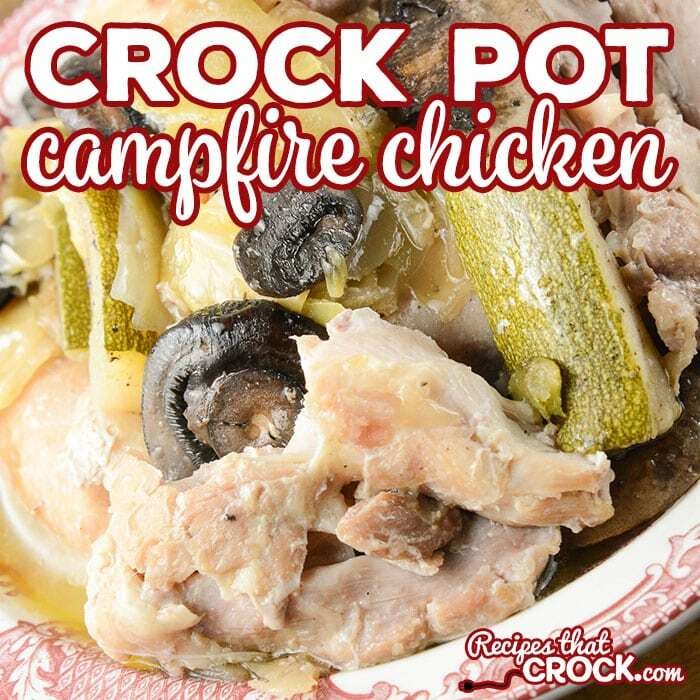 Crock Pot Campfire Chicken - Recipes That Crock! 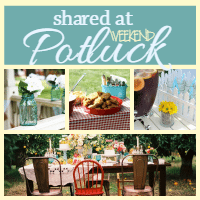 Are you looking for an easy one pot meal? 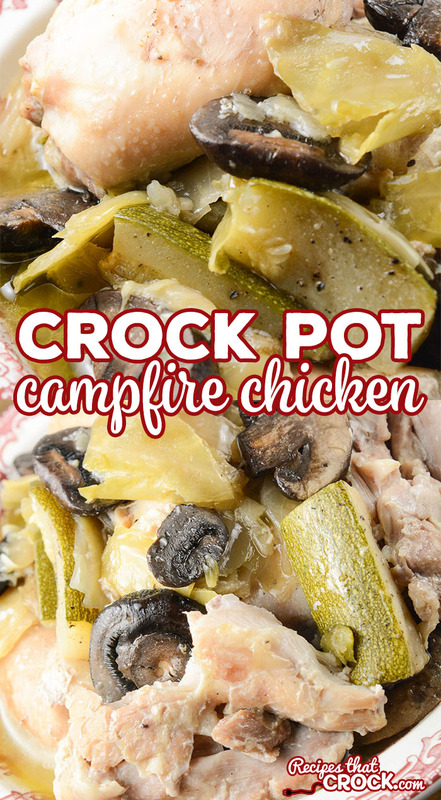 We love this simple Crock Pot Campfire Chicken for a delicious family dinner that just so happens to be low carb too. 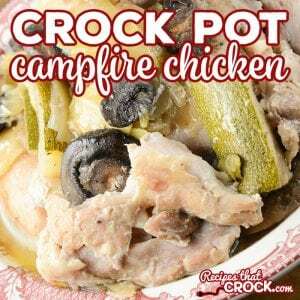 You guys loved our long time family favorite Pepper Jack Chicken so much I started thinking about other recipes we have made for years and years and realized I haven’t shared the recipe we make every time we go fishing: Campfire Chicken! This has been a staple in one form or another in our family for 22 years! While we have made this dish for years on the grill, it is even easier to make in the slow cooker. You just layer and season your chicken and add your veggies, topping with more seasoning and butter. Cook on high for 3-4 hours or low for 4-6 until veggies are tender and chicken is cooked through. If you would like more veggies, feel free to double the veggies in this recipe. 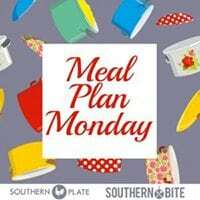 Cooking time may be a little longer, but you do not need to add any liquid (the veggies, butter and chicken will produce their own juices). You can use other forms of chicken, but it may adjust cooking time. We have made this recipe for years, substituting in different veggies to meet our tastes and needs. Feel free to use the veggies you love. 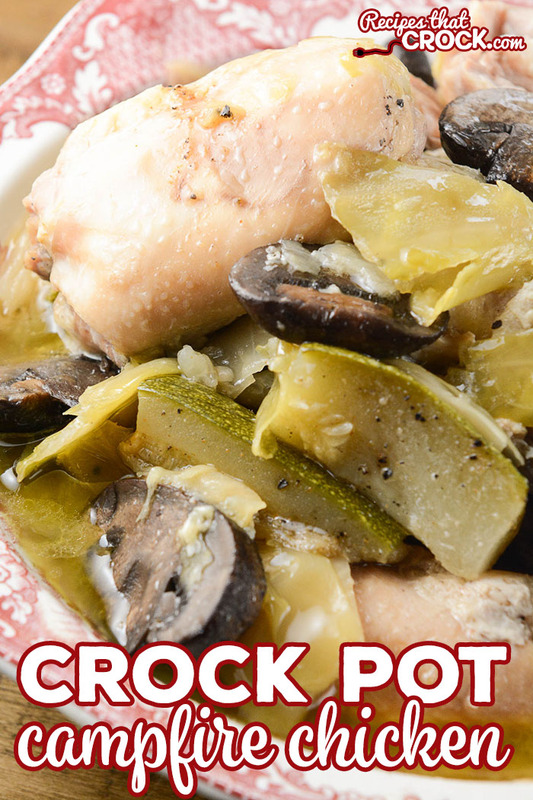 Place chicken into the bottom of a 6 quart slow cooker and sprinkle with garlic. Add cabbage, then mushrooms and then zucchini and season them with more seasoned salt and pepper. Place butter evenly over the top. I’m new to slow cooking techniques so I was happy to learn a lot from watching the video just now. About sizes of different kinds of veges and layering them in a certain order to cook correctly. Thanks for the information, it will help me a lot. I like it when it’s a learning lesson also. Slow cooking is so different than any other cooking I have ever done before. Can’t wait to try this either way (slow cooker and grill). I’m not low-carb so will definitely add potatoes and carrots, etc.